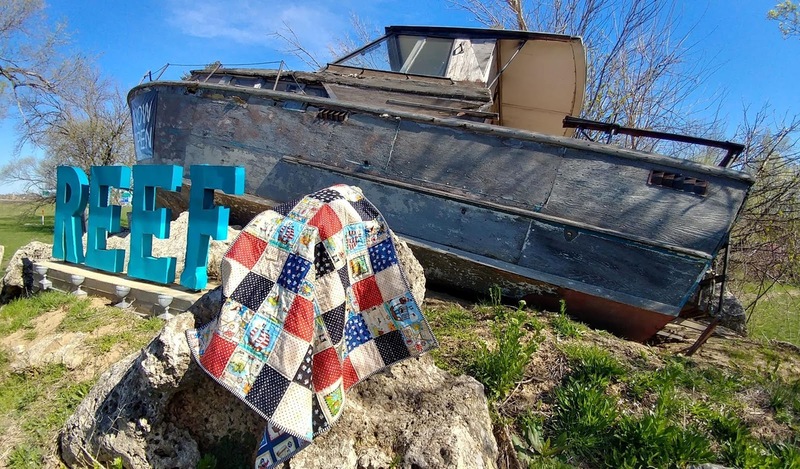 Slice of Pi Quilts: Ahoy! It's a Boy! I had a set of pirate print fat quarters and scraps by Makower UK that I bought from a friend, and a one-yard piece of a coordinating print that I found at a local garage sale! I cut the prints into 5" squares, then arranged them into an 8 x 8 grid alternating the light and dark prints. 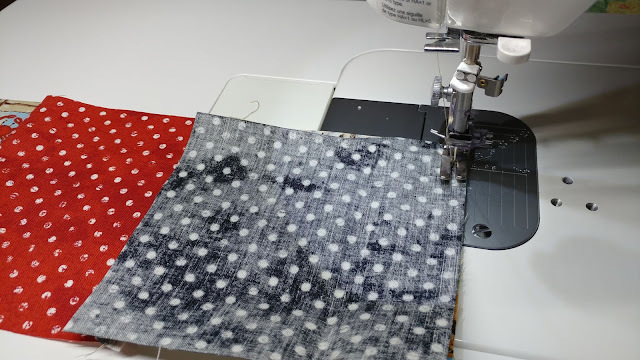 20 minutes to quilt it with Aurifil 50wt thread in color #2783, and 20 minutes to bind it. 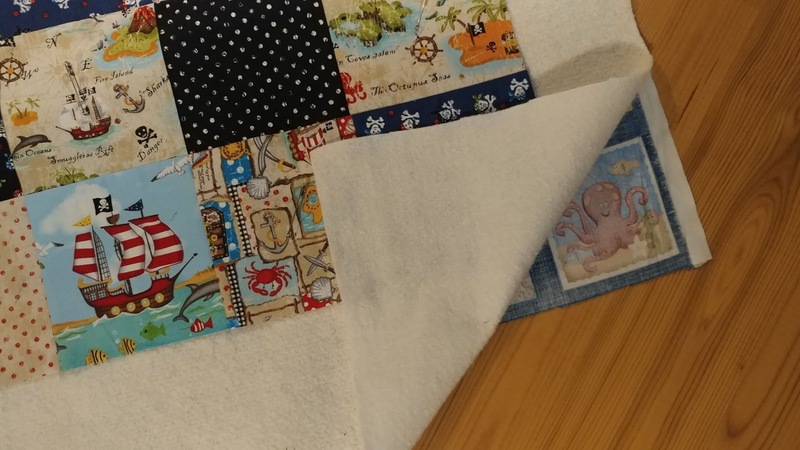 A baby quilt, start to finish in an hour and a half! The black and white striped binding was a great choice for this one. I printed a label on white fabric and used Steam-A-Seam 2 to adhere it to the back. The label has the Bible verse Deuteronomy 7:6 on it: "Out of all the people on the face of the Earth, the Lord has chosen you to be his cherished treasure." It was the closest verse I could find relating to a baby pirate! Ha! 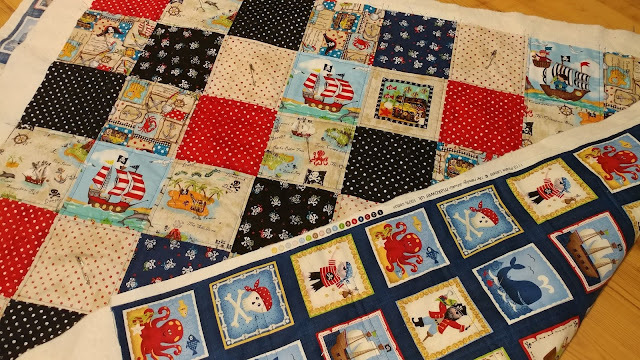 I also found a baby onesie with pirate ships on it that says "Daddy's First Mate" that I gifted with the quilt. 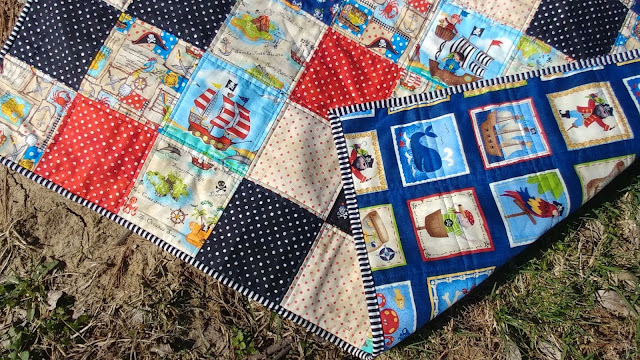 This quilt isn't intended to be an heirloom or a quilt that matches the nursery. I wanted to make something with humor that will hopefully translate to getting lots of use! 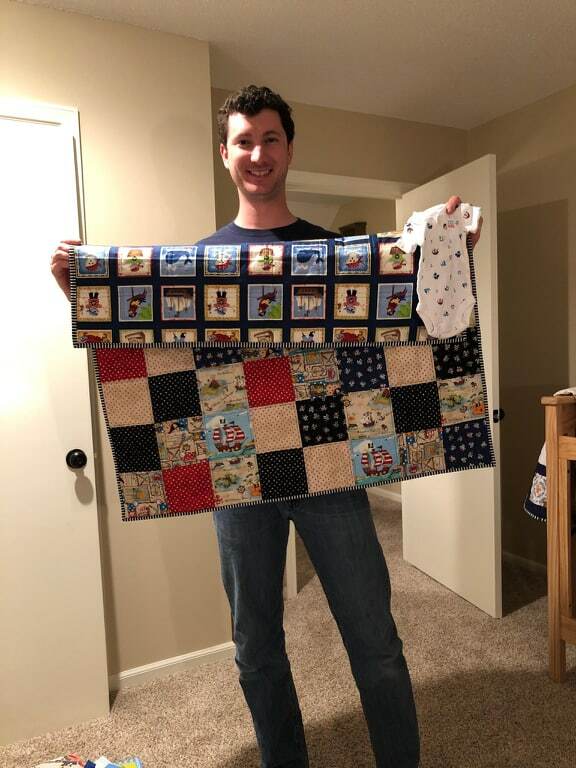 Now I just have to wait a few more weeks until I can get a picture of my nephew on the quilt! Linking up with Monday Making at Love Laugh Quilt, What I Made Monday at Pretty Piney, Midweek Makers at Quilt Fabrication, Wednesday Wait Loss at The Inquiring Quilter, Let's Bee Social at Sew Fresh Quilts, Needle & Thread Thursday at My Quilt Infatuation, Finished or Not Friday at Busy Hands Quilts, Can I Get a Whoop Whoop at Confessions of a Fabric Addict, and Friday Foto Fun at Powered by Quilting. How perfect, Laura! 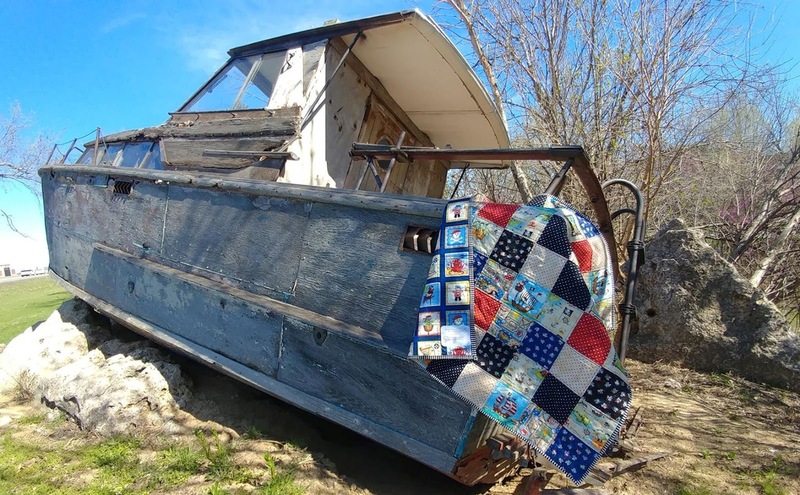 That quilt is definitely meant to be used and loved and I can see in the faces of your brother and sister-in-law how excited they are to welcome their first mate. 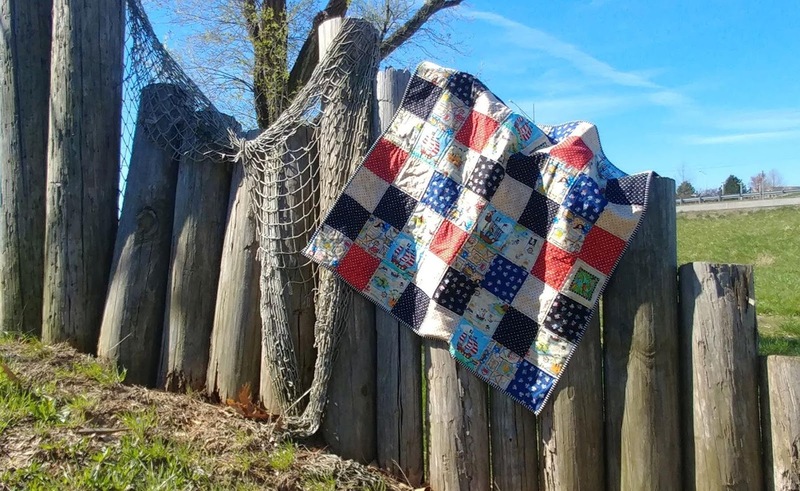 What a nice posting, quilt and all. Cute story, Laura! 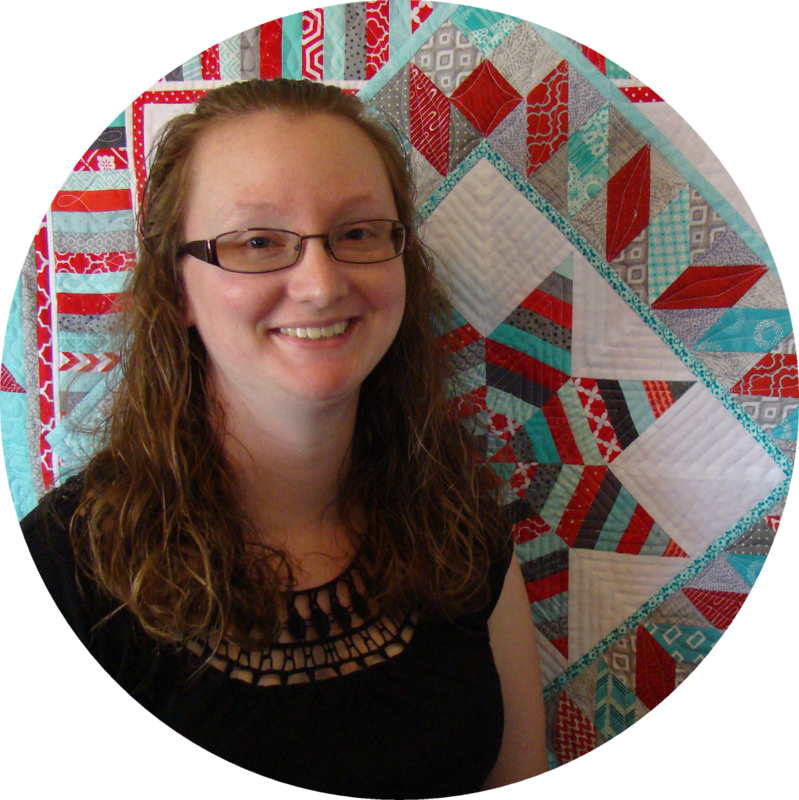 And you sure are fast at whipping out those baby quilts! Love the Bible verse for a baby pirate. 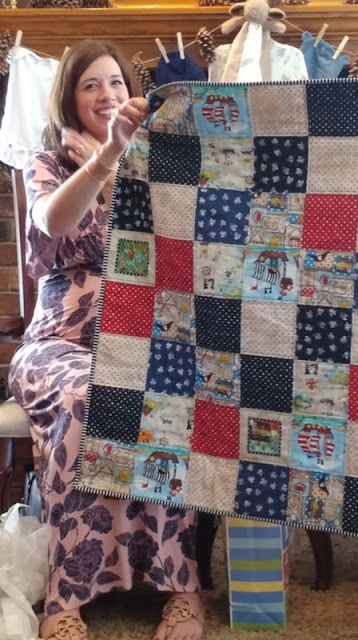 What a thoughtful quilt gift! 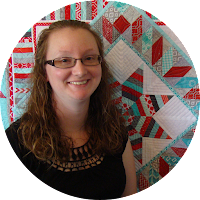 Even though the pattern is simple squares, I am amazed at how quickly you were able to go from pile of fabric to finished quilt! The matching themed onesie and the "cherished treasure" verse were like icing on the cake. Congrats on your new nephew! 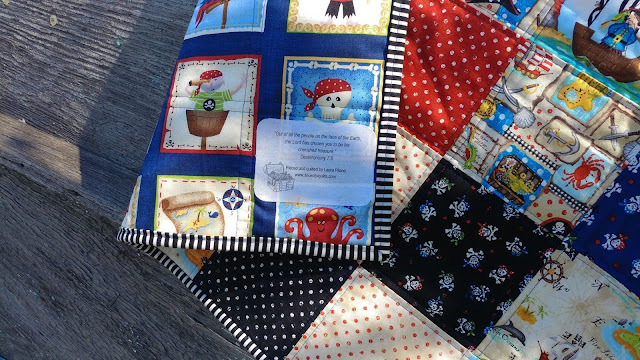 How thoughtful and perfect for a baby pirate. That is a fun story and quilt! I love your pictures by the shipwreck. You always come up with the most creative photos! What a great, thoughtful gift! 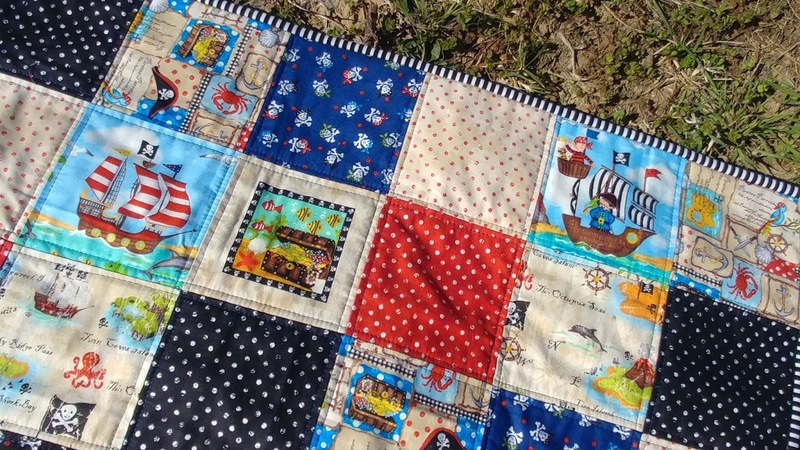 I love that you've been collecting pirate fabric for years hoping to use it for this purpose! I'm also impressed with the treasure bible verse. 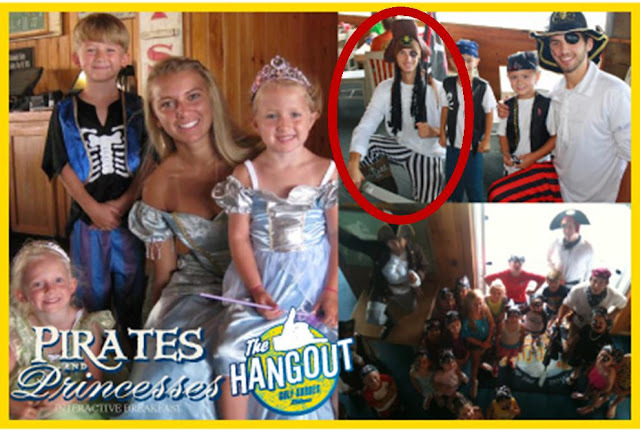 Here's hoping the little pirate will snuggle with his treasure for years to come! Beautiful baby quilt, I love this story! I can't help but think of Judge Reinhold in Fast Times at Ridgemont High. Beautiful quilt, and great location for a photo shoot! 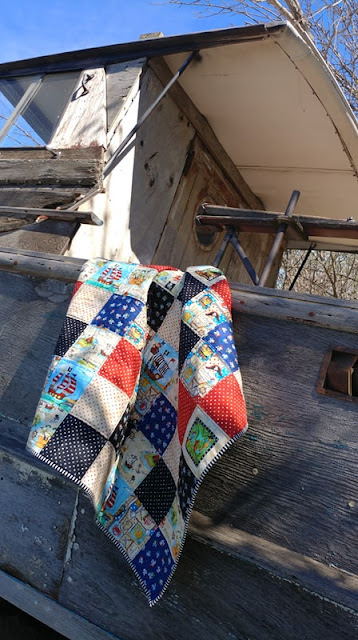 I can't wait to see pictures of your sweet nephew with his quilt. Thanks for linking up to What I Made Monday, and congratulations on the pending arrival to your brother and sister-in-law! Such a great idea. 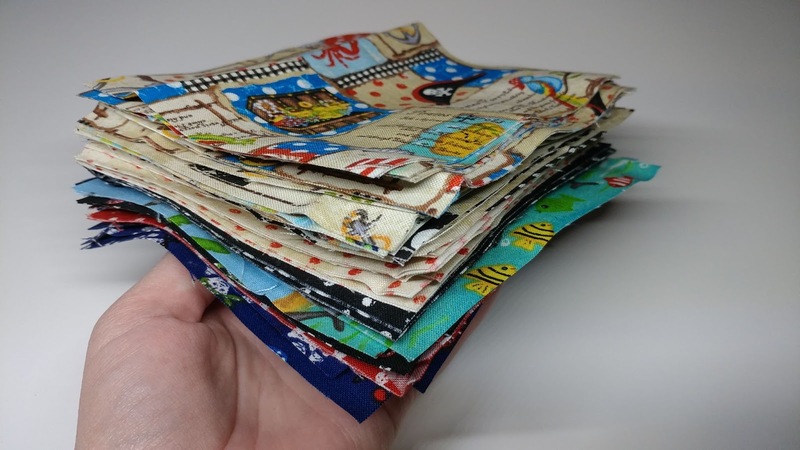 You have such a way of picking the right theme and fabric for the babies that come along. And a super fast finish. What luck finding that onesie to go with it. 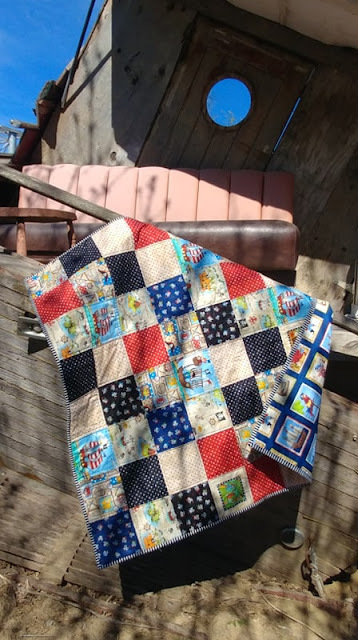 What an adorable quilt. And so wonderful that it has special meaning. Arrrrgggg! You done a first rate job of making this quilt. I love everything about it and especially the bible verse. Nice work!!! 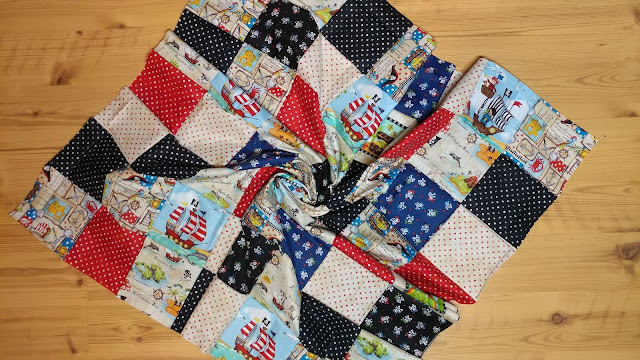 Super cute baby quilt. I love how you staged this one. Such perfect photos! Thanks for sharing on Wednesday Wait Loss.